Located right next to Manganji on the shore of Lake Shinji, the shrine is quite unusual in that it does not have a torii. It was in all probability part of the the same temple-shrine complex before the Meiji Period. The name of the kami enshrined here also suggest a Buddhist past: Nanagami Daimyojin..... which is in fact seven related kami. After returning from some years living in a palace under the sea Toyotama gave birth to a son Ugayafukiaezu in a famous legend involving a birthing hut. Fukiaezu married his aunt Tamayorihime , also enshrined here, and became the father of the mythical first Emperor Jimmu. The final two kami here are Konohanasakayuhime, now most commonly associated with Mount Fuji, the princess who married Ninigi and gave birth to Hoori, and the final kami who I am having difficulty tracing the relationship to the others is Kushiyatama, who is connected to the Kuniyuzuri myth and is I believe connected to a ritual that still occurs not to far from here at Hinomisaki Shrine. Heiwa Odori, "Peace Street" is the main road that runs up to the Hiroshima Peace Park and is lined with a lot of hi-rise buildings. Not sure what this first building is but I actually quite like it. The simplicity and color made it stand out for me. Right next door, this multi-use building includes a church and a kindergarden, and while not breathtaking in any way I also kind of like it. The first of the big hotels is the Oriental Hiroshima. For some reason the decoration on the top of the building reminds me of New York, a sort of neo art nouveau. Seems somewhat irrelavent. Dainichi-ji is now a Shingon temple. It was founded in the 8th Century by Gyoki who also carved the honzon of Dainichi Nyorai, the Great Sun Buddha. Kukai visited near here in the early 9th Century and according to the legend he carved a statue of Yakushi Nyorai out of a camphor tree using just his fingernails. It was housed at that spot in the Okunoin, inner sanctuary, of the temple. Primarily because of this statue the temple is believed to be efficacious for the treatment of illnesses related to the head and upper body. The Okunoin was destroyed in a storm and the Yakushi statue moved to the main temple. The Yakushi statue is a registered national Treasure. The temple is located in Konan City in Kochi Prefecture. Iwaya-ji, the 45th temple on the Shikoku Pilgrimage, is located among cliffs and rock formations in the mountains of Ehime and the name of the temple itself translates as "Rock cave Temple". It was an obvious site for Shugenja. These two carved reliefs are there. According to the legend the temple was founded by Kobo Daishi, and he supposedly carved the wooden Fudo in the main hall as well as the stone one pictured below which is located in a cave behind the main temple. The next two photos are both at Monju-in, the 9th Bangai Temple located just south of Matsuyama. Last week while across the river heading to pick up some firewood I was surprised to see some villagers from the little hamlet in a procession with a large Onusa heading to the riverbank. The next day, the 5th of May, both my village and the small town on the other bank would be having the Suijin Matsuri and would be doing the same thing, but this was the first time I had seen Ushiroyama doing it. We all live on the banks of the Gonokawa River, the longest river in West Japan, and like all river here it is prone to flooding and causing damage as well as drowning people. Its for this reason that the priest over in Kawado told me that the Suijin matsuri is the most important ceremony of the year. The end of the ceremony involves placing a large Onusa, most commonly referred to in English as a purification wand, attached to a long length of bamboo and hung over the river at several points to pacify Suijin, the river god. This is a photo of the largest Onusa, from the biggest of the Suijin festivals held in Kawado. I did not attend this year as I was away but I have posted on it before, here, here, and here. The biggest Onusa on our side of the river is this one, on a large sacred tree at the point on the river that used to be the main, and dangerous, crossing before the bridge was built. I have posted on the Tanijyugo Suijin Matsuri here and here. About 6 years ago I was walking along the coast down near Masuda and while passing through the fishing village of Tsuda spied this wonderful sculpture of an elephant sitting in someones garage. Obviously made from wood and rope that had drifted up on the nearby beach. A few weeks ago I was walking the same section of coast so I was wondering if the man who had made it had done any more. I was not expecting what I found!! There were now 2 big garages stuffed full of mysterious creatures and other figures all made from driftwood and other debris washed up on the beach. There were monkeys, bears, hippos, cats, owls, dragons, frogs, penguins, parrots, and several buddhist carvings including Ema the judge of Hell. The original elephant from 6 years ago was still there too. I found this moose particularly inventive, but my favorite was this frog. I liked that the artist, for that is what he is, had now arranged tableaux. There was another one, not pictured here, next to his front door too. This is the second post on the many statues found in the grounds of Kobo-ji temple in Hagi. This first one looks distinctly bored. None of the statuary was particularly outstanding, but there were a lot of them and they were quite diverse. Whatever was hidden behind these multiple layers of curtains has a story attached to it. "This tragic love story is similar to a verse of long epic "Everlasting Regret"by Hakukyoi who was a famous poet during Tang Dynasty. In the Genroku Era ( 1688-1704) some beloved concubine Kikuyo fell in forbidden love with some handsome page Fusanojo. Their employer got angry and banished him to an island. Before leaving her he promised her to make a faire every evening for her until he dies. Two months later its smoke had stopped. In her sorrow, she threw herself into the sea from the nearby Kikugahama Beach. Their employer felt pity and built this lovers grave for them. The final photo is a figure I am always on the look out for,,,,, Fudo MyoO. Located on the north shore of Lake Shinji. the grounds in front of the main hall of Manganji seem unusual to me. It is a Shingon temple and claims quite a heritage. According the temples founding legend Kukai (Kobo Daishi) stopped here after visiting Izumo Taisha in 824. He also took the time to carve the statue of Kannon. According to historical records this was a very busy time for Kukai, in 824 he was given control of To-ji in Kyoto, built Zenpuku-ji in what is now Tokyo, and was appointed to several government positions. The grounds were pleasant, but there were not a lot of statues. 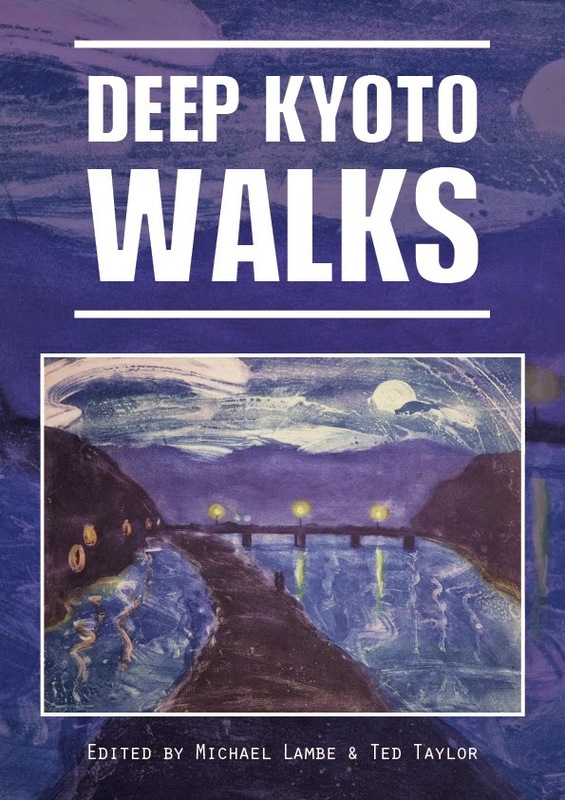 The editors of the new e-book Deep Kyoto Walks subscribe to one of my basic tenets, ie that the best way to learn about somewhere is to get out and explore on foot. They have collected together 20 walks around the former capital Kyoto and its vicinity. It is no mere guidebook though. The 16 writers are, with a couple of exceptions, non-Japanese who, by chance or design, have made Kyoto their home. I haven't done the math, but for sure their collective experience of the city must be at least 200 years. With 16 different writers you get a mixed bag of concerns. Some focus on history, some on nature, some on food, and a few do include some of the well known tourist attractions, but they are all very personal walks, so it is as if you have your own personal guide along with you pointing out things you may not notice or that locals would take for granted and not mention to you. Some of the writers will appeal to you more than others. From some of the pages there is a distinct odor ( I would not go so far as to use the word "stink") of Zen, and there is a bit of pretentiousness to some, though to be fair it would be hard to write about Kyoto without pretentiousness as the city was founded on the pretensions of the rulers and has been fueled by the pretensions of its inhabitants ever since, especially since the capital moved to Tokyo. The focus of the walks and the styles of the writing are varied enough that everybody should find more than enough interesting and enlightening. My own personal favorite was the piece by Michael lambe whose walk delved into some of the more modern history of Kyoto. 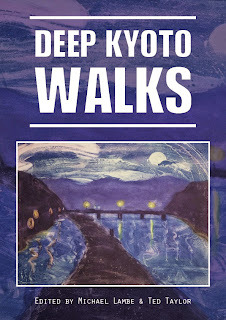 Each walk has enough detail to be easily followed but each also has its own map. I would recommend the book to anyone planning on visiting Kyoto, anyone who plans to revisit Kyoto, and even anyone who doesn't plan to visit.